Adjusting the bank angle during turns to correct for groundspeed changes in order to maintain a constant radius turn—steeper bank angles for higher ground speeds, shallow bank angles for slower groundspeeds. Arriving at specific points on required headings. With the airplane in the downwind position, the maneuver consists of crossing a straight-line ground reference at a 90° angle and immediately beginning a 180° constant radius turn. The pilot will then adjust the roll rate and bank angle for drift effects and changes in groundspeed, and re-cross the straight-line ground reference in the opposite direction just as the first 180° constant radius turn is completed. The pilot will then immediately begin a second 180° constant radius turn in the opposite direction, adjusting the roll rate and bank angle for drift effects and changes in groundspeed, again re-crossing the straight-line ground reference as the second 180° constant radius turn is completed. If the straight-line ground reference is of sufficient length, the pilot may complete as many as can be safely accomplished. In the same manner as the rectangular course, it is standard practice to enter ground-based maneuvers downwind where groundspeed is greatest. As such, the roll into the turn must be rapid, but not aggressive, and the angle of bank must be steepest when initiating the turn. As the turn progresses, the bank angle and the rate of rollout must be decreased as the groundspeed decreases to ensure that the turn’s radius is constant. During the first turn, when the airplane is at the 90° point, it will be directly crosswind. In addition to the rate of rollout and bank angle, the pilot must control the wind correction angle throughout the turn. Controlling the wind correction angle during a turn can be complex to understand. The concept is best understood by comprehending the difference between the number of degrees that the airplane has turned over the ground verses the number of degrees that the airplane has turned in the air. For example, if the airplane is exactly crosswind, meaning directly at a point that is 90° to the straight-lined ground reference. If the wind, in this example, requires a 10° wind correction angle (for this example, this is a left turn with the crosswind from the left) the airplane would be at a heading that is 10° ahead when directly over the 90° ground reference point. In other words, the first 90° track over the ground would result in a heading change of 100° and the last 90° track over the ground would result in 80° of heading change. As the turn progresses from a downwind position to an upwind position, the pilot must gradually decrease the bank angle with coordinated aileron and rudder pressure. The pilot should reference the airplane’s nose, wingtips, and the ground references and adjust the rollout timing so that the airplane crosses the straight-line ground reference with the wings level, and at the proper heading, altitude, and airspeed. As the airplane re-crosses the straight-lined ground reference, the pilot should immediately begin the opposite turn—there should be no delay in rolling out from one turn and rolling into the next turn. Because the airplane is now upwind, the roll in should be smooth and gentle and the initial bank angle should be shallow. As the turn progresses, the wind changes from upwind, to crosswind, to downwind. In a similar manner described above, the pilot should adjust the bank angle to correct for changes in groundspeed. As the groundspeed increases, the pilot should increase the bank angle to maintain a constant radius turn. At the 90° crosswind position, the airplane should also have the correct wind correction angle. 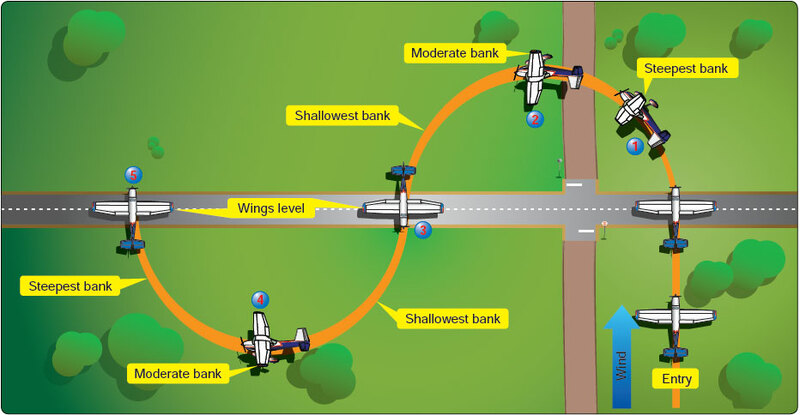 As the airplane turns downwind, the groundspeed increases; the bank angle should be increased so that the rate of turn is used to maintain a constant radius turn. Failure to manipulate the flight controls in a smooth and continuous manner when transitioning into turns.